Your generous donations make a major impact! Thousands of kids have walked through our door looking for a way to turn their lives around. Thanks to your support, they receive the help and guidance they need to shift their lives in a positive direction. Sustainers make a meaningful, lasting contribution to the children and families at ACS! Become a Sustainer by signing up to make an automatic recurring gift. You can choose to give your gift weekly, monthly, quarterly, or yearly. Click here to become a Sustainer Today. You can change the value of your donation or discontinue at anytime. Call or email Robyn Eastwood at 617-494-0135. Visit our Amazon Wishlist to purchase the supplies that we need for our Treatment Program. We also are in need of gift cards in increments of $5.00 to stores like Dunkin Donuts, CVS, Subway, and Target. Gift cards can be mailed to ACS, Attn: Development Department, 189 Cambridge St, Cambridge, MA 02141. 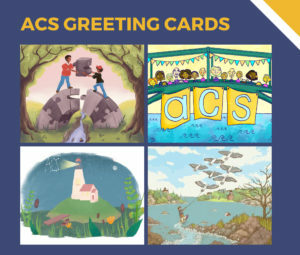 Purchase your own set of one-of-a-kind greeting cards designed by MassArt students! All proceeds benefit ACS’s work with court-involved kids and families. $18.00 for 12 cards (3 of each design) Inside is blank. To purchase cards, email Robyn at [email protected]. Do you shop at Amazon? By simply shopping through Amazon Smile a portion of your purchases will be donated to ACS with no extra cost to you! Log into your Amazon account at www.smile.amazon.com and select Adolescent Consultation Services as your charitable organization! Remember to include “smile” in the web address every time you shop through Amazon and every purchase will help children in need at ACS. It’s as easy as that! If you (or your spouse) work for a company with a matching gift program, you can increase the size of your gift through a corporate match to ACS. To find out if your company has a matching gifts program, contact your Human Resources department. Your donation goes directly to funding our programs. Read some of our Voices to see first-hand how ACS is changing lives and helping kids succeed. If you have other ideas of how you want to give or have any questions, please contact Robyn Eastwood at 617-494-0135.